But, you’re not sure which hammock to buy. You’re not sure which is the best hammock, what styles are available, or why you’re damn personal assistant won’t pick up her phone! (she normally makes these decisions). Not to worry. Below you should find some simple info geared to make the hammock buying process a bit easier. Quick note: If you’re shopping for a hammock to use in the woods while camping, or a stiff, waterproof, canvas back-scratcher to relax in poolside during torrential downpours then our hammocks are not for you. You can probably find the best hammock for you in this handy hammock buying guide. If, like most people, you’re shopping for a hammock with incredible style and comfort to hang in the house, on the patio, or in the backyard when it’s nice weather out then you need to buy a Lazy Bandido hammock. We’ve tried to make the hammock buying decision as stress-free as possible. Since all of our hammocks are made to the same specifications you don’t need to worry about which size is best, which material is right, or “should I buy a hammock with a spreader bar or without,” etc. We’ve searched for the best hammocks in the world, with the best weave pattern, material and most popular size. The summary below explains why our hammocks combine the best features you’ll want. Or, click here to read a more detailed account why our hammocks are better than the rest. Our hammocks are hand-woven in Nicaragua using a time-tested technique of weaving thousands of feat of soft cotton in an interwoven diamond pattern. This makes the hammock incredibly comfortable and breathable. Pure 100% cotton. Cotton hammocks are much softer than synthetic materials and provide the most comfortable nap possible. Our hammocks are the perfect size for one large adult. It’s possible to squeeze in your partner—the hammock supports up to 400 lbs.—but it’s most comfortable for one person. Spreader bars make hammocks unstable. The Nicaraguan people—who weave the hammocks and use them pretty much every day don’t use them…which should tell you something. Our hammocks are the most decorative hammocks in the world. Each original design was created by a professional artist to reflect the fascinating characters that make Nicaraguan culture interesting. The result. Eye-catching hammocks that make a big statement in your living room, patio, or backyard. 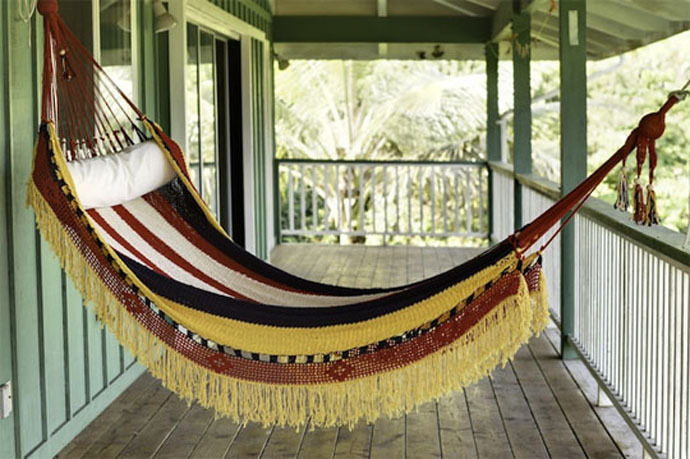 People looking for a warm but modest hammock often go with the Campesino. If you’re looking for an attention-grabbing hammock the two most popular choices are the Gringo and the Bandido hammock. The Revolucionario hammock looks great in a cabin or a Northwoods type-of home. In fact, El Revolucionario was recently selected as a “Must Buy” item in Cowboys & Indians Magazine’s 2011 Holiday Gift Guide. El Patron has a great design without being overpowering and El Santo has one of the most beautiful, brightest designs of any of our hammocks. Perhaps it’s best to see and compare our hammocks side-by-side.